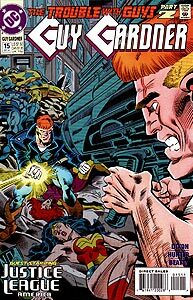 Cover Description: Guy Gardner faces off against Guy Gardner. Justice Leaguers Blue Beetle II, Booster Gold, Maxima, and Wonder Woman lie scattered and unconscious on the ground. Brief Synopsis: Guy Gardner and the Justice League hunt Guy Gardner's "evil" twin. Issue Notes: The cover of this issue indicates that this is the second part of "The Trouble with Guys" story. ...Guy Gardner. 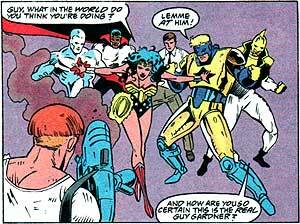 It turns out that the "Guy Gardner" with the team since Booster received his new armor has been an alien impostor. This is the second time that one of Booster's teammates has been replaced by a duplicate. He should be getting used to it by now. POWER UP: Booster joins Bloodwynd, Captain Atom, Maxima, Wonder Woman, and the real Guy Gardner in search of the escaped doppelganger. Again Booster flies with no visible means of propulsion, suggesting that his Legion Flight Ring provides his lift. DON'T MAKE 'EM LIKE THEY USED TO: The "evil" Gardner again disables Booster easily, removing him from the fight. Though this armor was described as less powerful and more cumbersome than Booster's previous power suit, he has to be getting frustrated by being beaten by everyone and everything that he has fought in it so far. At this point, the scorecard indicates Booster's Mark II armor 0, Enemies 4. Boosterrific Review: The only significant disappointment in this run-of-the-mill superhero slugfest is the amateurish art of Chris Hunter, which is no better than work found in the margin doodles of a high school student's class notes. If it were possible to read a comic book with your eyes closed, now would be the time. Awful art but I enjoyed the story which is the aftermath to the interesting and insightful "GG: Year One" which gave me new appreication to Guy.